* This is my column in BusinessWorld on March 22, 2018. Among a plethora of so many global comparative indices — competitiveness index, economic freedom index, corruption index, energy security index, happiness index and so on — there is an interesting one called the World Giving Index (WGI). It is produced by the Charities Aid Foundation (CAF), a UK-based international NGO. 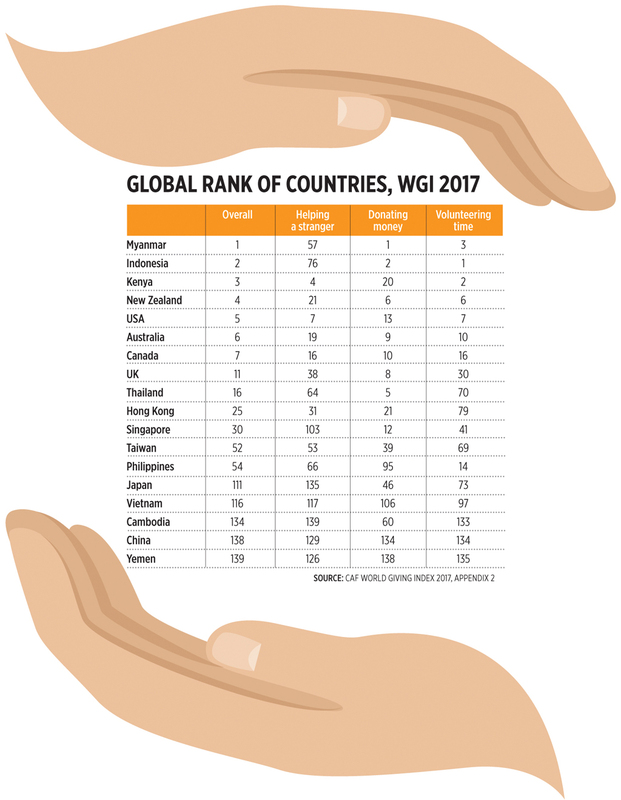 WGI 2017 is based on data from Gallup’s World View World Poll research project covering 139 countries in 2016. Some 1,000 questionnaires are completed by a representative sample of individuals living across a country. Bigger countries have bigger samples collected, like 4,373 interviews in China. Overall, more than 146,000 people were interviewed by Gallup in 2016 and samples are probability-based. Surveys are carried out by telephone or face-to-face depending on the country’s telephone coverage (see table). The result seems plausible except that Japan’s ranking only 111th out of 139 countries might raise one’s eyebrows in disbelief. Japan’s prosperity is largely a result of its being a trustworthy nation and hence, giving-oriented. One can put big investments in time and money on something and trust that no one will confiscate, steal, or destroy that investments. Gallup and CAF may have to revisit their questionnaires or the individuals they have asked. 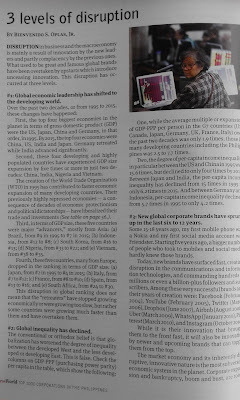 Nonetheless, it is worth noting that the top two world rank were secured by ASEAN countries Myanmar and Indonesia. The Philippines is 54th or within the upper half. Communist China is 2nd to the last, one notch before Yemen. Now there is a bill in Congress known as the “Food Waste Reduction Act.” It is a lousy bill because (1) it does not believe that Filipinos have capacity for voluntary donation and thus, it wants to “make it mandatory to donate edible food surplus for charitable purposes.” And (2) it does not believe that there are already existing processes and organizations, global-regional-national, that accept and distribute food donations by companies and individuals. One such global and regional organization is “Second Harvest Asia” also known as Food Banking in Asia. Its regional head is Charles McJilton and its Philippine representative is Bruce Hall, an American married to a Filipina academic and mainly residing in Iloilo City for two decades now. This bill may sound good to some but hidden in it are huge interventionist policies. It intends to cover nationwide all food manufacturers; all food establishments (restaurants, cafes, diners, fast food chains or hotels); all supermarkets with at least 500 square meters of selling space; and all culinary schools which offer culinary, baking, and pastry courses with at least 50 students. The monitoring and inspecting agencies will be the Department of Social Welfare and Development (DSWD) in coordination with the Local Government Units (LGUs). Can one imagine the opportunities for abuse and extortion by some personnel of these agencies? “1. Will companies release this type of information? Our discussion with food companies in the Philippines and Japan is that they do not want to release this information as it gives their competitors information about sale. 2. In France, they created a law requiring supermarkets to enter into a contract with food banks. What happened is that brokers started charging a finder’s fee to supermarkets to “assist” them in entering a contract with a food bank. Government and legislators should stay away from mandating and penalizing individuals’ and private enterprises’ voluntary giving. Government should focus its resources and manpower catching real criminals — thieves, murderers, rapists, kidnappers, land-grabbers, arsonists, terrorists, plunderers, protectors of criminals, both outside and within government itself. Top 12 countries in lowest unemployment rate. 6/12 are from the ASEAN -- CM, TH, LA, BR, VN, SG. 4/12 though have old data, as of end-2016. Some of these 12 countries have zero personal income tax (QA, BR) or low flat tax (Macau 12%, Belarus 13%, Tajikistan 13%). Data from Trading Economics. Unemployment rate of 2-3% is somehow considered as "full employment" economy. The 2-3% of labor force who are looking for job but have no jobs at the time of labor survey/questionnaire are considered as "voluntary unemployment" normally due to high "reservation wage" and other factors. For instance, a person is offered a job for P20k a month but he refuse to accept it because he/she is waiting for another job call that would give him/her P25k a month or higher. Or a person is offered a job somewhere at a high rate but refuses to take it because he/she wants to work only nearby even at a lower pay. Say to help take care of a sickly parent/s, sibling or child. Governments should reduce restrictions and rigidities in the labor market. More laws to "protect labor" actually result in less labor hiring because the employers' flexibility to re-allocate resources, capital-labor-technology-land, flexibility to fire lazy or irresponsible staff, is limited. Another #EarthHour today, an annual global campaign by the WWF. Darkness is either good or bad. If good, then people should do it nightly or many hours a night like North Korea, not just 1 hour/year. And #fossilfuel is either good or bad. 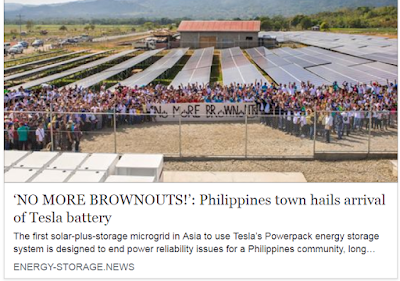 If bad, then people should stay off-grid because the grid transmits and distributes 50% of all PH electricity coming from coal power, another 20% coming from oil and natural gas, both fossil fuels. One cannot say "Fossil fuel is bad but I'll keep using it anyway". That hypocrisy and double talk is like saying that "Corruption and stealing is bad but I'll keep doing it anyway." #CCC, #WWF, #AlGore, #UN, #DENR, #Greenpeace. See also WWF double talk here. It wants a "zero-carbon world", fine. People, companies, foundations, governments, UN agencies, should donate/send more money to the WWF to help attain this goal. Then WWF officials and people are into frequent global climate talks/meetings. Fine, they should be riding solar planes, giant kites, uber-brooms or uber-witches, to move across countries and continents. They hate CO2-emitting oil used by commercial planes, buses and cars; they hate CO2-emitting coal, oil and gas power plants. And WWF, GPeace, many other environmental activist groups are also campaigners of "climate justice" movement. They demand "system change" -- referring to change from capitalist system to socialist or communist system. Cool. The main purpose of Earth Hour campaign is to sustain climate alarmism, to keep scaring, fooling and milking the people of "man-made" warming/climate change so we need "man-made" solutions via more government, more UN, more carbon/coal/oil taxes, more climate loans (World Bank, ADB Philippines), more climate bureaucracies, more/frequent global climate junkets. For them, there is little or no such thing as "nature-made" warming/CC. They deny that CC is natural; deny that CC is cyclical; deny that global cooling can happen after global warming; deny that the Sun, galactic cosmic rays, clouds and water vapor, ocean oscillation, other natural factors are big drivers of climate; deny that CO2 is a useful and non-pollutant gas. They are the big deniers then turn their fingers around so that large-scale climate robbery and trillions of $ scam will continue. * This is my contribution for BusinessWorld Top 1,000 Corporations 2016. I forgot to post this earlier. Disruption in business and the macro economy is mainly a result of innovation by the new leaders and partly complacency by the previous ones. What used to be great and famous global brands have been overtaken by new and upstarts which introduce unceasing innovation. This disruption has occurred at three levels. 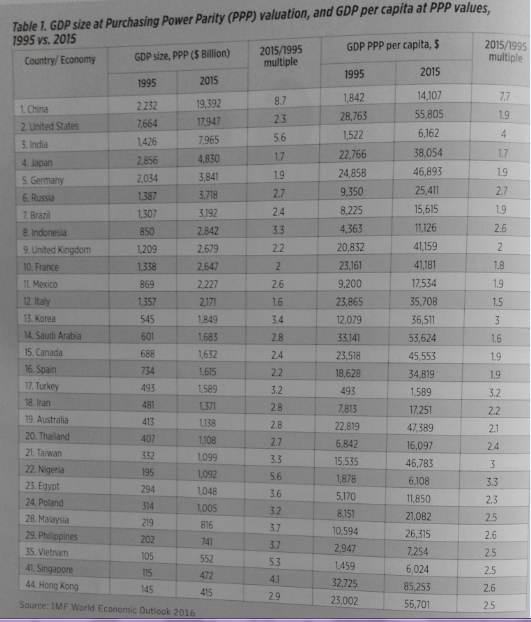 First, the top four biggest economies in the planet in terms of gross domestic product (GDP) were the US, Japan, China and Germany, in that order, in 1995. By 2015, the top four economies were China, US, India and Japan. Germany retreated while India advanced significantly. Second, these four developing and high population countries have experienced GDP size expansion by five times or more in just two decades: China, India, Nigeria and Vietnam. The creation of the World Trade Organization (WTO) in 1995 has significantly contributed to faster economic expansion of many developing countries. Their previously highly-repressed economies – a consequence of decades of economic protectionism and political dictatorships – have liberalized their trade and investments. Third, in terms of GDP size, these five countries were major “advancers”, mostly from Asia: (a) Brazil from #9 in 1995 to #7 in 2015, (b) Indonesia from #12 to #8, (c) Korea from #16 to #13, (d) Nigeria from #33 to #22, and (e) Vietnam from #38 to #35. Fourth, these five countries, mainly from Europe, dropped in the ranking in terms of GDP size: (a) Japan from #2 in 1995 to #4 in 2015; (b) Italy, from #7 to #12, (c) France, from #8 to #10,(d) Spain, from #13 to #16, and (e) S. Africa, from #24 to #30. 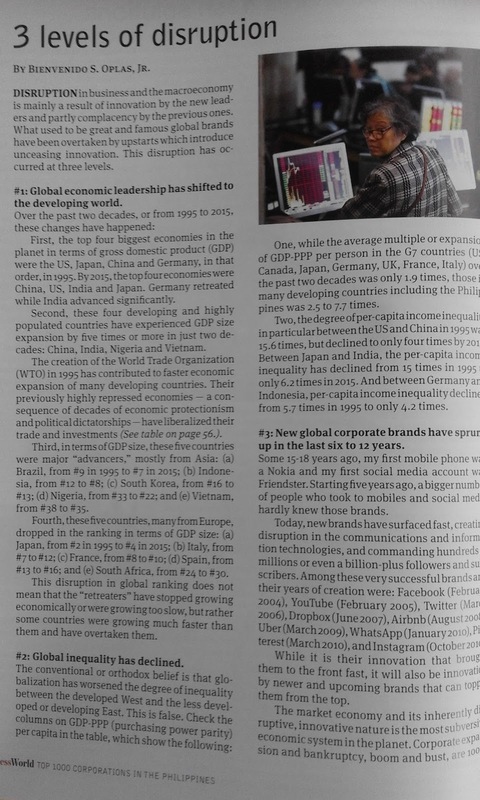 This disruption in global ranking does not mean that the “retreaters” have stopped growing economically or were growing too slow, but rather some countries were growing much faster than them and have overtaken them. # 2: Global inequality has declined. One, while the average multiple or expansion of GDP-PPP per person in the G7 countries (US, Canada, Japan, Germany, UK, France, Italy) over the past two decades was only 1.9 times, those by many developing countries including the Philippines was 2.5 to 7.7 times. Two, the degree of per capita income inequality in particular between the US and China in 1995 was 15.6 times, but declined to only four times by 2015. Between Japan and India, the per capita income inequality has declined from 15 times in 1995 to only 6.2 times in 2015. And between Germany and Indonesia, per capita income inequality declined from 5.7 times in 1995 to only 4.2 times. # 3: New global corporate brands have spurred up in the last six to 12 years. Some 15-18 years ago, my first mobile phone was a Nokia and my first social media account was Friendster. Starting five years ago until today, a bigger number of people who took to mobiles and social media hardly knew those brands. Today, new brands have surfaced fast, creating disruption in the communications and information technologies, and commanding hundreds of millions or even a billion plus followers and subscribers. Among these very successful brands and their years of creation were: Facebook (February 2004), YouTube (February 2005), Twitter (March 2006), Dropbox (June 2007), Airbnb (August 2008), Uber (March 2009), WhatsApp (January 2010), pinterest (March 2010), and instagram (October 2010). While it is their innovation that brought them to the front fast, it will also be innovation by newer and upcoming brands that can topple them from the top. The market economy and its inherently disruptive, innovative nature is the most subversive economic system in the planet. Corporate expansion and bankruptcy, boom and bust, are 100% part of its DNA. And this makes the system pro-consumers, gifting them with newer, more useful, more price-competitive products and services. China leapfrogged to become the world’s fastest growing economy because of two things: its communist government allowed private property ownership and free trade to flourish, and it has a billion-plus producers and consumers. So two important lessons for the Philippine economy to join the band of disrupters in the planet are (a) have more market competition and innovation, less government regulations and taxation, and (b) take advantage of its “population dividend”, a generally young and big population – a big army of producers and consumers, entrepreneurs and workers, scattered within the archipelago and across the world. Year to date (Ytd), January 01 to March 23, 2018, PH stockmarkets 3rd poorest performing in Asia Pacific after Japan and Shenzhen, China. 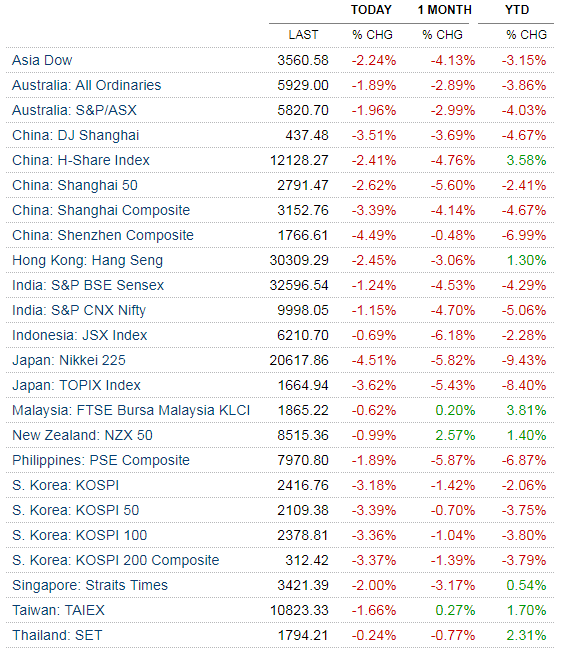 Buddy-buddy Duterte-Xi Jinping in spooking investor sentiment. 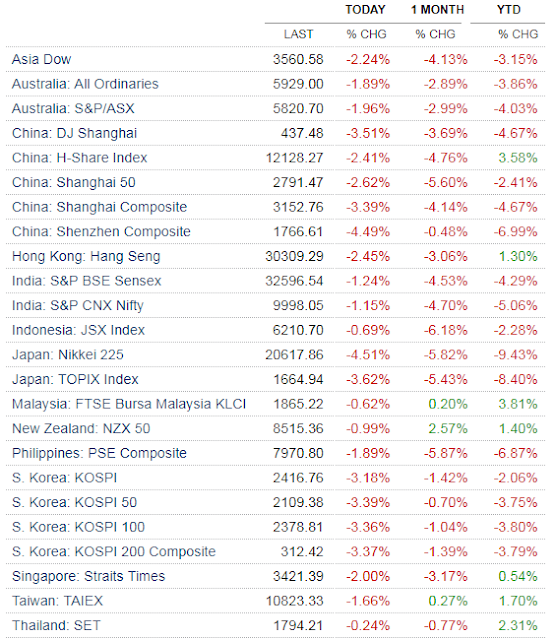 PH markets cheap already? Maybe, maybe not enough yet given continuing political uncertainty pulling down investor confidence. Below 8,000 is breached, it might go down further to 7,800. Unnecessary uncertainties must go -- forcing the resignation of the SC CJ, her impeachment moves in Congress. Cha-cha de federalism and TRAIN 2, TRAIN 3, etc are already big uncertainties for businesses. Latest inflation rate data for Asia dragons and emerging markets are there. 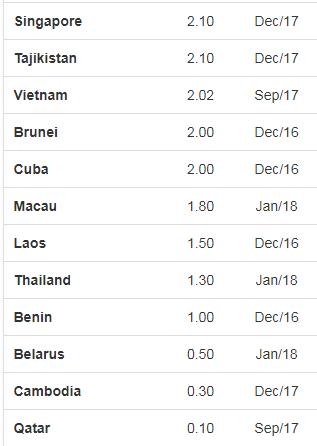 Out of 13 countries, PH has 2nd highest inflation jump in Feb 2018 vs Dec 2017, +1.2 percentage points, 2nd only to HK which experienced an outlier jump of 3.1% infl in Feb 2018 vs only 1.7% in Dec. 2017, also in Jan. 2018. Not included in this big jump in PH inflation rate are fare hike adjustments by jeepneys, taxi, truckers, bus lines, shipping lines, airlines, no thanks to tax-tax-tax de TRAIN. This "close Boracay" drama of Malacanang is unnecessary. Outright demolition of illegal structures might suffice. Big and small hotels, local and foreign airlines, big and small travel agencies, big and small boat enterprises, all affected by "close Boracay" pronouncements. About the so-called US "trade war", I think it is just sensational media term. For now it's trade positioning, no actual "war" of high tariff vs high tariff yet. At $2B+/day of US trade deficit, for many years, this was ok with Bush administration, then Obama 8 years of "hope and change" but not ok with Trump. See also: Ytd, PH stockmarket is the poorest performer in AsPac, March 15, 2018. Today, a global coalition of 62 market-oriented independent or non-government think tanks and institutes sent a letter to the WHO. Three institutes from ASEAN countries were among the signatories -- CIPS in Indonesia, IDEAS in Malaysia, and MGT in the Philippines. * This is my article in BusinessWorld on March 19, 2018. Part 1 of this short study was published in this column on Feb. 15. 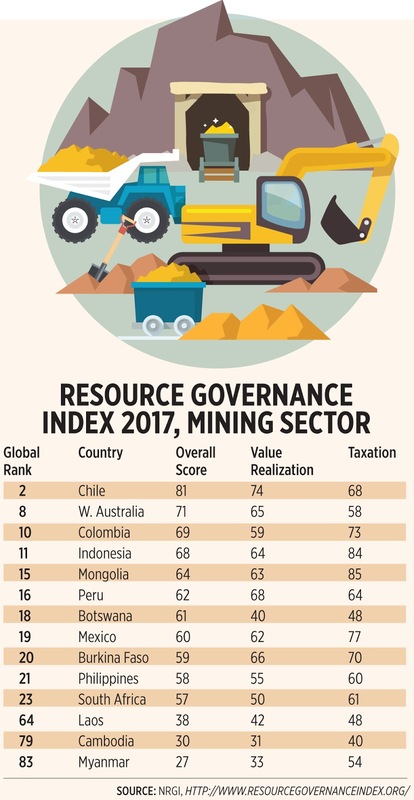 Some corrections and adjustments are made here because of (a) lower coal consumption for power generation, and (b) using an incremental increase in coal excise tax. Total coal consumption in 2016 was 23.2 million tons but one industry player informed me that not all of these were used for coal power plants. Some were used for cement plants and other industrial uses. The estimated amount used for coal power generation is 20 million tons. Coal excise tax before TRAIN (Tax Reform for Acceleration and Inclusion) was P10/ton, the law has increased this per ton to P50 in 2018, P100 in 2019, and P150 in 2020. The incremental increase is used in the table below. Meralco computation of oil cost for their captive customers based on November 2017 data was 0.6 centavos/kWh in 2018 when oil tax is only P2.50/liter. There are no projections for 2019-2020 so I estimated the numbers for these years using the respective oil tax rates of P4.50 then P6/liter. Oil share in Meralco power distribution that period was only 0.9% of total. In 2016, oil share to total power generation nationwide was 6.2%. So a multiplier of 7x (= 6.2/0.9) is used for the national oil tax rate. Before, VAT on transmission charge was minimal, it applied only on ancillary service. With TRAIN, the VAT is applied on other transmission costs (power delivery, system operator, metering, etc.). Hike in universal charge is not included here but this might be minimal. Many island provinces and remote islands of big provinces get electricity from gensets running on diesel. The generation cost is naturally high, from P10-20/kwh but residents there are not charged that full amount, a big portion is subsidized and passed on to all other consumers nationwide via the universal charge. Last month, the Energy Policy Development Program (EPDP) published a new study, “Electricity prices and TRAIN” by Dr. Ramon L. Clarete. It is a neat study because it considered variations in heat content per coal type (Yes, not all coal are the same, the same way that not all dogs are the same). For brevity purposes, I added only a portion of his table 5 which summarize the projected hikes in electricity prices because of TRAIN (see table). 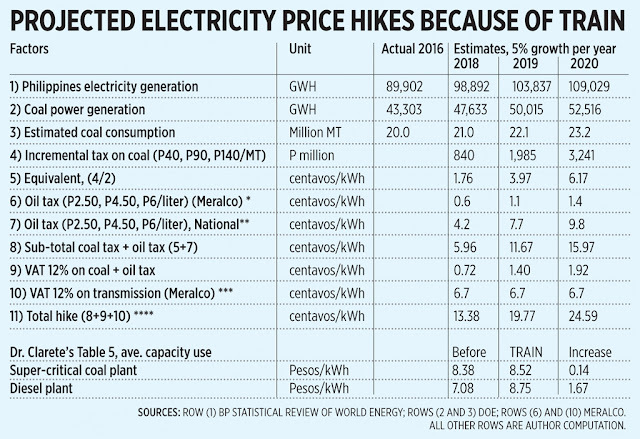 So from my estimates, there will be a projected electricity price hike in centavos/kWh of 13.4 this year, nearly 20 in 2019, and 24.6 in 2020. The estimates by Dr. Clarete are much higher. By 2020, 14 centavos/kWh for coal plants and P1.67/kWh for diesel plants. VAT on these hikes are not included yet, and VAT on transmission charge also not included. In addition, Dr. Clarete used coal price for 2016 in his study. The average price per ton of thermal coal was $70 in 2014, $58 in 2015, $66 in 2016, $85 in 2017 (Q1-Q3), data from statista.com. In the first three months of 2018 it is around $100 average. So with 2018 prices about 50% higher than 2016 prices, the projected rise in electricity price from coal plants would be higher than his estimated 14 centavos/kWh, perhaps could go up to 18 centavos or higher. These costs are for direct household electricity consumption alone. Not included are pass-on rates in the form of higher prices by factories, schools and universities, shops and malls, hotels and restaurants, hospitals and airports, etc. These enterprises consume tens of thousands of kWh per month, the additional electricity cost will be passed on the consumers, which might affect sales and hence, affect future salaries and benefits of workers. The tax hike for coal and oil products is among the worst mistakes of TRAIN law. Retaining the high 12% VAT is another. Government has no justification in making cheaper energy become expensive. We hope that these mistakes will be recognized soon so that succeeding TRAIN 2, TRAIN 3, etc. will either reverse them, or at least not make them even worse. This story contains half-truths and hence, can be considered as fake news. à Solar + battery will never be cheap in the short-term. Long term perhaps. I think Leviste’s current cost of solar + battery is at least P5.90/kWh (higher than P4/kWh for coal, natgas, others) and it cannot produce electricity 24 hours straight especially when it is cloudy and raining for many hours during daytime. à Imagine that? solar PV + Tesla battery + diesel genset, that cannot be cheap. With higher diesel prices because of TRAIN, gensets would cost at least P10-15/kWh. They will need the genset to run every night, 365 nights a year because there are days and weeks where the Sun doesn’t shine (monsoon season, 1-2 weeks, sometimes 3 weeks, of rains and thick clouds non-stop). à Partly true because islands that run on power barges and huge gensets and hence, run on 100% oil really have high electricity cost, between P10-25/kWh depending on the remoteness of the island. But they are not mentioning this comparison. à Outright disinformation and dishonesty. To have 1MW of installed solar PV will need about 1.2 to 1.5 hectare of land. So if one targets 5,000 MW installed solar, one will need 6,000 to 7,500 hectares of land, zero crops, zero tree because solar hates shade from any tree. And with only about 18% capacity factor (36% day time, zero at night), a 5,000 MW solar plant can actually produce only 900 MW on average, not 5,000 MW. à Wrong. Many islands and provinces still have regular “Earth Hours” until now. Palawan, Masbate, Romblon, Marinduque, etc. Mindoro island, composed of two provinces Mindoro Or. and Occ. is growing very fast because of the RORO system where hundreds (or thousand plus?) of cars, motorcycles, buses and trucks traverse daily from Manila/Batangas to Panay island (4 provinces of Aklan, Antique, Capiz, Iloilo) and vice versa. A number of big tourism areas like Puerto Galera, Abra de Ilog. Mindoro does not have its own power plant. It is time that it must have its own, at least a medium-size 100 MW coal or hydro plant. A more appropriate title would be "No more brownouts! Philippines town hails arrival of diesel genset." A genset will give electricity 24/7 even if the Sun does not shine for weeks due to monsoon rains and daily thick clouds. Just put diesel continuously and have regular maintenance. The cost though will be 3x to 5x or more than that of a coal plant or hydro plant. Mindoro has lots of rivers because the island has plenty of big and tall mountains. Big and small hydro, run-of-river hydro should be feasible in some areas. Last February 28, 2018, the ruling party PDP-LABAN celebrated its 36th anniversary -- with the China Ambassador to the PH and other China officials on stage. Yes, why celebrate with officials of the China Communist Party? Ewww. Officials and leaders of the dictatorial, one-party, authoritarian government? That government cannot even allow facebook, youtube, twitter to its own citizens because communists and dictators are highly insecure. Now the buddy-buddy of PH ruling politicians and would-be communists? Introduce Xi Jinping thoughts on socialism and dictatorship to the ruling PH party, wow. Mabuhay komunismo, Mabuhay Xi-Tsino-Dutertismo? The China Communist Party, is a one-party, zero-opposition, dictatorial, authoritarian party. When the Party Congress voted to remove the term limit of the China President, many of their citizens reacted negatively so state agencies in charge of social media censorship disallowed posts with words or terms like "immortality","1984". Politicians like House Speaker Alvarez and Senate President Koko Pimentel perhaps wouldn't mind having a dictatorial, authoritarian party as their buddy. Little or zero opposition, in political power forever, sino ayaw na politiko doon? I just hope that the Liberal Party or any new political party can re-assert the classical liberal philosophy: more individual liberty and economic freedom, less state intervention ala socialist-communist govt. Propagate the thoughts of John Locke, Adam Smith, David Ricardo and John Stuart Mill -- NOT Karl Marx, Lenin, Stalin, Mao Tse Tung, Xi Jinping. * This is my column in BusinessWorld last week, March 15, 2018. Rotary is wrong. Water and sanitation is not a human right, thought it can be a civil right. Human rights are those things that we have because we are human, that we are born with, that we have been endowed with by our Creator. Human beings are born with the ability to communicate, to pray, to move, to think... human beings are born free. Someone must use violence or threaten to use violence (like an army or a police force) to take away those things. Those are human rights. When violence is used to take away those things from us, that is oppression. Our human rights are violated. We are not born with a lifetime supply of water or sanitation. We must work hard -- and we must work together -- to provide those things to ourselves and to others. 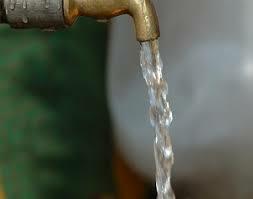 If we don't have water and sanitation, that might be our fault, or the fault of others, or the fault of no one. The lack of water is NOT ALWAYS the result of oppression. If we die of thirst in the desert or on a lifeboat at sea, who oppressed us? The lack of human rights is ALWAYs the result of oppression, is always the result of someone's act or threat. Thirst can be the result of oppression, or someone taking away our life, liberty and pursuit of happiness, but it could also be the result of something else. Therefore water cannot be a human right. I agree with Bruce here. People can live on top of high hills and mountains far from natural water sources and government should bring pipe water to them because water is their "human right"? Bad proposition. Re UN SDGs declaring that water is a human right, almost everything should be a "human right" for the UN actually. Free healthcare, free education until university, free books, free medicines, free condoms, etc. And soon free iPads, free flat tv, free cars for the poor? To take away human rights requires an act and therefore an actor. It requires oppression. To have human rights requires no action, no actor. We have human rights BECAUSE WE ARE HUMAN. Nothing more is required. A government isn't required, technically, for us to have our full human rights. However, there will always be people who may try to take away our human rights. Therefore we band together to defend ourselves, and we might call that government. Governments are instituted among men, as the saying goes. * This is my column in BusinessWorld last March 11, 2018. As the public still has to adjust to the inflationary pressures of the new law called Tax Reform for Acceleration and Inclusion — Package 1 (TRAIN 1), TRAIN 2 is already in Congress. Among the targets are further tax hikes in “sin” products, and some NGOs that speak, write, and argue like government have been calling to further raise alcohol and tobacco taxes. 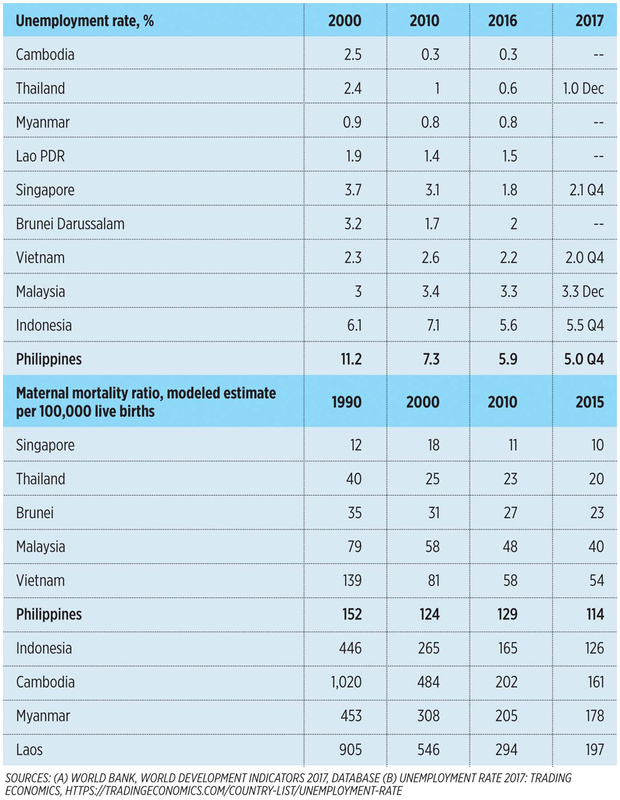 Such calls are based on certain premises and hypothesis like: (1) Philippines tobacco and alcohol consumption per capita is among the highest in Asia and the world; and, (2) the overall health of Filipinos is stagnating if not deteriorating because of high alcohol and tobacco use. Thus, consumption of sin product must be discouraged further via higher taxes plus other measures like graphic warnings. How true are such premises and hence, how valid is the more-taxes-please measure as the purported solution? The good news is that some basic data — like smoking incidence — are available and can be found at Our World in Data, a project of the University of Oxford. The bad news is that the data does not seem to support or corroborate those two premises and hypothesis (see table). 1. Philippines tobacco use as of 2012 was not that high and was lower than tobacco use of our richer and healthier neighbors like Japan and South Korea. Alcohol use in 2015 was lower than the global average of 6.3 liters per person per year. 2. Philippines life expectancy keeps rising, not falling or remaining steady, although it is among the lowest in the region. 3. People in countries with a high incidence of smoking also have high life expectancies. 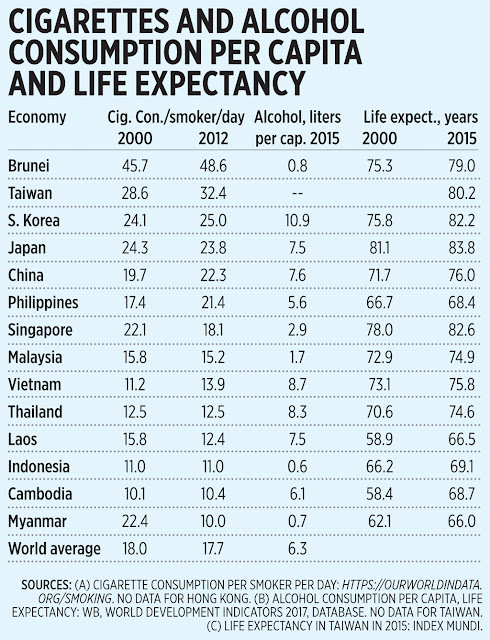 Brunei, Taiwan, South Korea, Japan, China, the Philippines, and Singapore have high cigarette use — at least 18 sticks per day per smoker in 2012 — and their life expectancy was at least 76 years in 2015 — except in the Philippines where it was only 68 years. 4. People in countries with low cigarette use (less than 12.5 sticks per smoker per day) also have low life expectancies of only 69 years or less. 2. People in poorer countries consume “less tobacco” referring to the legal and branded products, but in reality, they consume “more tobacco” from illegal, illicit, and fake/counterfeit products and suppliers. And such consumption is not captured by official government data. So the statement “more sin taxes = less alcohol and tobacco use” can be wrong. 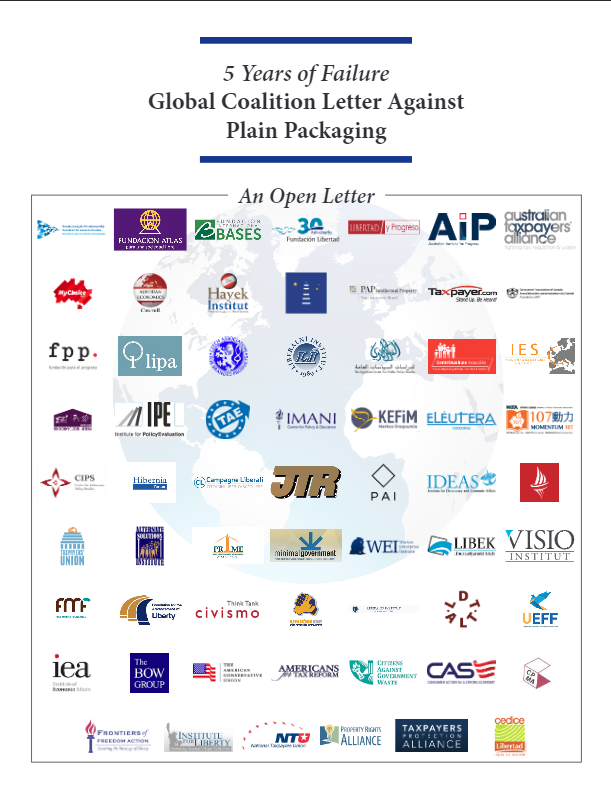 Another possibility is that higher sin taxes can lead to more smuggling, more illicit trade of counterfeit products that are cheap and more affordable to more people, which can lead to more smoking and drinking. Even rich and developed Australia, which has more strict regulations against tobacco use, has experienced a rise in cigarettes smuggling. In a KPMG report in March 2017 entitled “Illicit Tobacco in Australia, 2016 Full Year Report,” the estimated share of illicit and smuggled tobacco was 10.8% of total tobacco consumption, average for 2007-2012. This rose to 14% average for 2013-2016. Instead of calling for higher sin tax rates, the government should focus on significantly controlling smuggled and illicit products that are cheap and readily available. This alone will significantly reduce the incidence of smoking and drinking. Another compromise would be a rise in sin taxes but income tax rates (personal and corporate) and/or VAT rates should go further down. The people should be spared from government’s policy and mentality of endless tax hikes, regardless of administration. 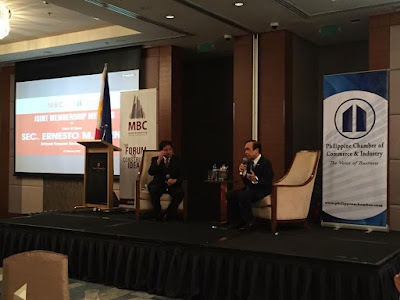 NEDA secretary Ernesto Pernia admits China's interest rate of 3% is much higher than Japan's 0.25%-0.75%, in talk in front of businessmen and economists this afternoon. "Pernia admits China's interest rate of 3% is much higher than Japan's 0.25%-0.75%... because 'we need more friends.'" Ok, PH taxpayers are "less friends" of the Duterte administration that is why we must pay more taxes via TRAIN and they will give more money to their "more friends" China Communist Party. Magaleeeng. To the Dutertenomists and TRAIN rah-rah boys and girls -- eto abangan nyo: the main purpose of "more revenues via TRAIN" is not exactly more infra but more payment for China loans. We have NLEX, SCTEX, TPLEX, SLEX, STAR, CAVITEX, NAIAEX, Skyways, etc even without big tax hikes. Lots of "hybrid PPP" were actually integrated PPP before President Duterte came to power. Integrated PPP means no need for new ODA, new loans from China or elsewhere, no need for tax-tax-tax because the private builders of those big infra have the financial, technical and engineering resources, network to build those behemoth structures at minimal cost to taxpayers (only right of way cost, etc). Hybrid PPP means more loans, especially from the China communist party. Recall also that when Ernesto Pernia was newly appointed as NEDA chief, he justified the series of drugs murders as "necessary evil." @SecPernia: First basket of infra projects for Chinese financing includes Kaliwa Dam, Chico River Pump Irrigation, North-South Railway south line between Manila and Bicol. Wow, tax-tax-tax de TRAIN so that PH govt can pay these big loans fr China? Horrible. These shd be integrated PPPs and not charged to taxpayers. Japan offers better quality performance at cheaper cost. Why in heaven’s name will you burden us with this preposterous idea? Pernia: We don’t want a repeat of our previous experience with China (referring to NBN-ZTE deal), that’s why PH and Chinese govts established vetting process for Chinese firms bidding for PH projects under @NEDAhq ICC @InquirerBiz. "Under the previous administration, the P18.72-billion Kaliwa dam had two pre-qualified bidders, which are now out of the picture... It used to be a public-private partnership, with MWSS as implementing agency. Since the project is funded by ODA from China, Mr. Velasco said there will be no pre-qualification stage since the Chinese embassy identifies the three pre-qualified companies." Another big China loan, contractors and suppliers identified by China embassy, very likely cronies of the China Communist Party. PH goverment agencies will wait for the terms and say "Yes", and PH taxpayers will pay for the bill, courtesy of TRAIN de tax-tax-tax. A few weeks ago, an EU ambassador posted in Sri Lanka repeated to me what a Chinese diplomat told him: 'No big deal. The Philippines is not even a real country.' Nasaktan talaga ako." "Nonoy Oplas got it all wrong — making a comment without even knowing the context. Rather unscholarly and malicious!" I replied, "Ok Sir Ernie, what is the non-malicious explanation why (a) PH government should get new foreign loans when many projects were already under integrated PPP (not "hybrid" that require new loans, or new public spending and hence, new taxes), and (b) why China loans considering that China interest rates are high, and China Communist Party is a theft of PH territory? I will apologize for my statements above if these can be clarified. Thank you." As I expected, no further reply or clarification. For those who keep believing that global warming and climate change is anthropogenic or man-made, who believe that they can "fight" GW and CC via more government, more UN, more carbon taxes, more renewables cronyism, more climate bureaucracies, more global climate meetings, please widen your mind. Natural or nature-made GW and CC is factual than CO2-is-pollutant-evil drama. More galactic cosmic rays (GCRs), more cloud cover, more cooling of the planet. 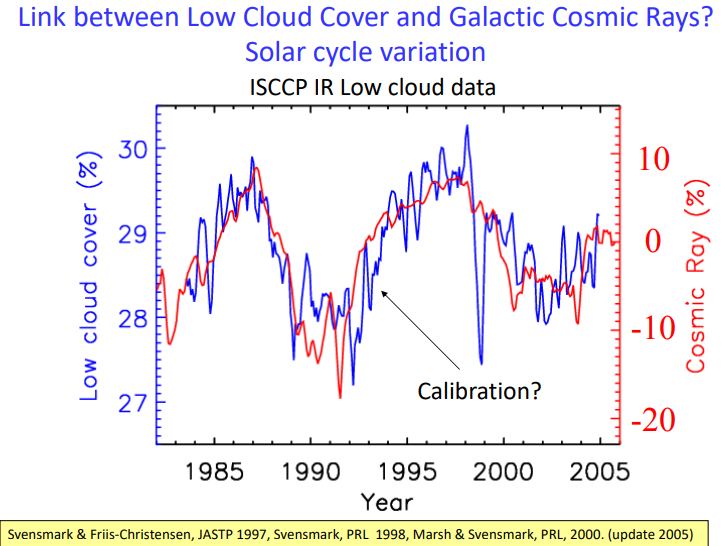 Conversely, less GCRs, less clouds, more warming of the planet. That’s the conclusion of a new paper just published in the research journal Space Weather. 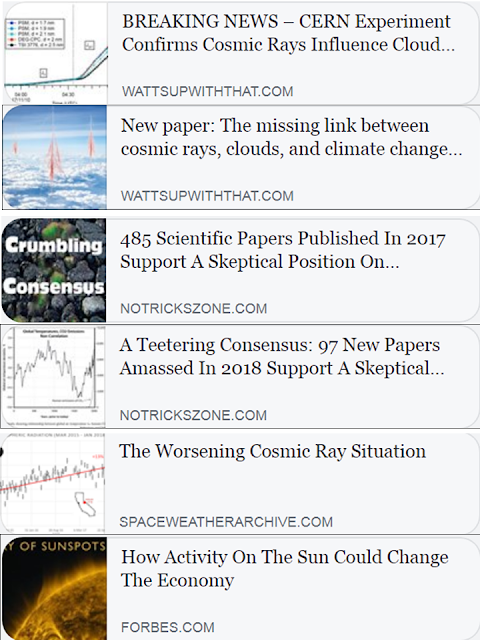 The authors, led by Prof. Nathan Schwadron of the University of New Hampshire, show that radiation from deep space is dangerous and intensifying faster than previously expected…. Over the last decade, the solar wind has exhibited low densities and magnetic field strengths, representing anomalous states that have never been observed during the space age. As discussed by Schwadron et al. (2014a), the cycle 23–24 solar activity led to the longest solar minimum in more than 80 years and continued into the “mini” solar maximum of cycle 24. During this weak activity, we observed galactic cosmic ray fluxes that exceeded the levels observed throughout the space age, and we observed small solar energetic particle events. Here, we provide an update to the Schwadron et al (2014a) observations from the Cosmic Ray Telescope for the Effects of Radiation (CRaTER) on the Lunar Reconnaissance Orbiter (LRO)…. One of the most important problems facing humanity, global climate change, is discussed. 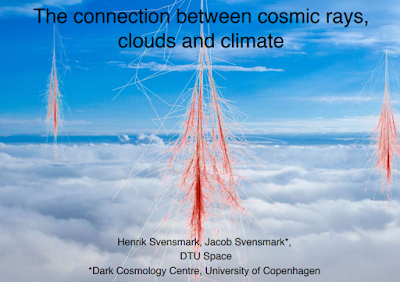 The roles of cosmic ray fluxes and solar activity in this process are analyzed. Although several mechanisms explaining global climate change have been proposed, none of them are firmly grounded. 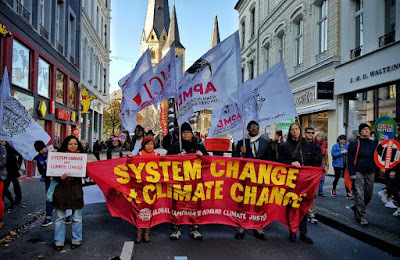 At the United Nations summit in Paris at the end of 2015, it was decided that greenhouse gases are responsible for the global warming of our planet. However, the authors of this work believe the question of what causes global changes in the Earth’s climate remains open, and will obviously be solved once and for all in the next 10–15 years. * This is my column in BusinessWorld on March 08, 2018. There are many legislative and executive proposals now that are meant to protect workers but have the long-term effect of discouraging the hiring of more workers. These five measures seem to stand out. Currently there are 15 national non-working holidays with pay. Then there are city/municipal non-working holidays proclaimed by local governments. Plus paid leaves provided for by special laws like solo parent leave and maternity leave. Plus work suspension with pay during strong typhoons, floods, and other calamities. Plus work suspensions due to politics like nationwide jeepney strikes. Now there are legislative proposals to create new holidays with pay. Among these are: the last Monday of January as National Bible Day; and, July 27 as Iglesia ni Cristo anniversary day. A bill called the “Expanded Maternity Leave Law” proposes to raise the maternity leave period to 120 days or four months. This will cover all female workers regardless of civil status or legitimacy of the child. Solo parents would be granted a total of 150 days maternity leave with pay. Fathers will also enjoy a 30-day leave with pay versus the current seven days of paid leave as provided for under RA 7322. Penalties for violations are high — fines up to P20,000, imprisonment for six to 12 years, or both. This is removing the employers’ and contractors’ flexibility to hire workers when demand for work is high. Like catering and malls, demand for business and labor is high during November and December due to the Christmas holidays and reunions, then tapers off by January. Even the unskilled should be paid the mandated minimum wage. The danger of this policy is that the less-skilled or skilled but less industrious workers will not be hired, raising the unemployment situation in the country. These populist and welfarist proposals are based on the premise that: our employment rate is high and workers can easily find other jobs, and the health of Filipino mothers and workers are deteriorating. Both are wrong. 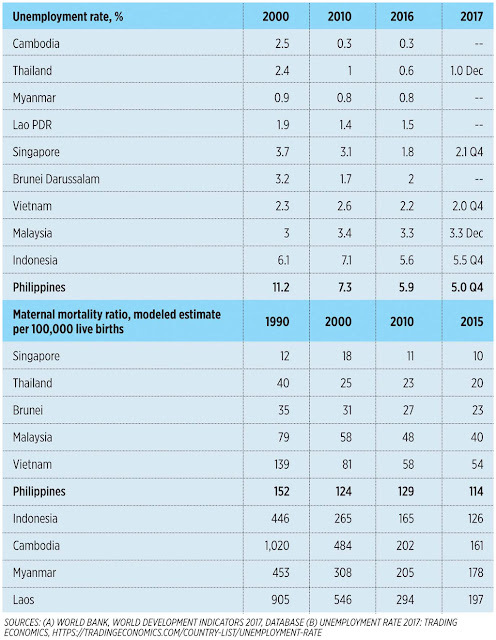 Our unemployment rate is the highest in the ASEAN, and Filipinos’ maternal mortality is decreasing although not as low as that of Singapore and Brunei (see table). The danger of these proposals is that they make the hiring of workers, especially female workers and managers, become more expensive. If this trend continues, less workers will be hired — only the very talented, very efficient ones will be hired and the rest will be working in the informal, less well-paid sector or will be begging for more subsidies and cash transfers from the government. And more workers doing repetitive jobs will be replaced by machines, robots, and artificial intelligence (AI). Machines do not ask for holidays with pay or maternity/paternity leaves with pay, and consumers want cheaper goods and services from shops and manufacturing plants. Employment is not a right or entitlement. It is a privilege for those who have clear ambitions, personal responsibility, and equip themselves with certain skills. Entrepreneurship and being in business is also not a right or entitlement. It is a privilege for those who have deep patience and efficiency to understand both the consumers and suppliers of various production inputs, plus some luck. And the patience to deal with bureaucracies and politicians with very fickle and populist mind-sets. Employment is a private contract between employers and would-be employees. If the terms are bad for job seekers, they should have more options for other employers. Better yet, employ themselves via micro-entrepreneurship or small start-up businesses. Government should step back from setting and dictating the terms of employment and focus on enforcement of contracts. Government should also de-bureaucratize business and entrepreneurship so that more workers can migrate to become employers someday more easily.